Like we mentioned it feels like one of the Serpent family for sure. Nice and clean, nothing over the top (classy). It’s nice and compact, has dual airflow slots on the bottom, and easy top fill. A nice chunky Ultem drip tip sits on top with nice rounded edges for a great mouth feel (looks like an 810 but is 510). You can change out for your own tip easily too. The build deck is two posts in parallel with a screw on each end for a total of four, this allows you to place a coil in any orientation easily. Airflow is two slots a side that hit the coil from the side and slightly below with your coil positioned to be a little above the bottom airflow slot. It’s a simple design that works well. The bottom of the deck is elevated and has two wicking ports (more on this later). Overall the design is fine, nothing overly exciting or new though. Flavour is good, it’s a condensed atty with little distance for the vapor to travel. There is some slight doming on the chamber that helps too. It’s above average but the wicking has trouble keeping up with multiple hauls and you will sense a dryness as you vape. Airflow fully open is too wide for us and we don’t think it could handle the build it would need to make this amount of flow work. But with it closed down to half or even less it’s a great restricted lung hit. Smooth, swooshy, and pretty quiet. Building is a treat, the coil drops in easily and you can’t have the wrong orientation. Just pick the right screws, then centre it and get the height right. There is a lot of space in there but we find you are limited to the wicking port size. 2.5-3mm works best in our opinion. High gauge claptons are quite nice and add flavour in the SMM. Now for wicking. We have to disagree with a lot that has been said about the SMM being easy to wick. In theory it should be. But we haven’t had very good results or performance. We have tried many different methods, wick lengths, and placements all with similar results. It’s somewhat anemic, can’t handle multiple hits without going dry (not dry hits, just not very saturated). 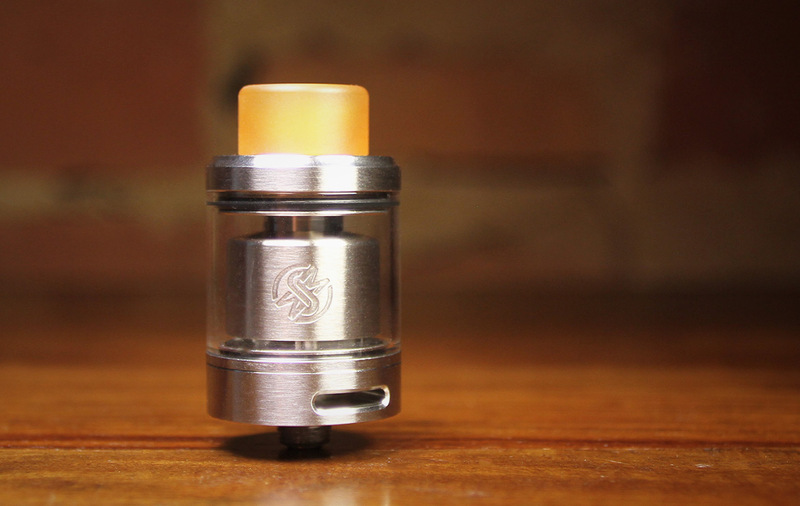 So if you are a more casual vaper, you will love the SMM, but if you like to chain vape the SMM is not for you. Juice capacity is great, 4ml for how condensed the atty is is surprising. The top fill juice ports work great, and with it wicked well there is no leaking on refill. All good. Wotofo is going a little bananas lately, a company that started with some success with the Freakshow and parlayed that into some great RTAs is doing well but maybe should slow down a sec. Figure out what they want to accomplish. If it’s innovation, that takes some time. Releasing so many products so quickly doesn’t sound like the way to dominate the market, it sounds like a way to water down your better offerings (Apple in the 90s). The Serpent SMM is okay, nothing overly groundbreaking, decent performance, and a clean look to keep most happy. We would just like to see something exciting from Wotofo. If you need another tank and don’t chain vape grab one if you like. A lot of what is coming from Wotofo in the coming weeks is of no interest to us, so we will hold off a while and see what’s next. I got my Serpent SMM 3 days ago 3/7/18. Opened it, cleaned it. The post screws were very tight and a pain to loosen. Dropped in the coil. Easy. As to Wicking. It was a breeze the first try. I read a review that gave a wicking tip. Just cut your cotton tails just short enough to slightly extend beyond the wick holes. Works great and I chain vape. Good flavor. Happy to hear you are loving the Serpent SMM. Vape On!